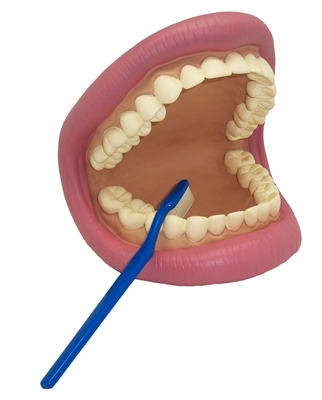 Children learn to brush teeth and basic oral hygiene with this large detailed dental teaching aid for kids. A learning toy for home, school or dentist office. Includes demonstration toothbrush and teacher's guide about how to brush teeth. Hand puppet human mouth model is approx. 8" wide to comfortably fit an adult or child hand. The flexible mouth can open and close. Jumbo mega mouth puppet can be used to teach basic tooth and lip structure and oral anatomy. A creative learning dental education puppet toy for ages 3+, latex and BPA free.